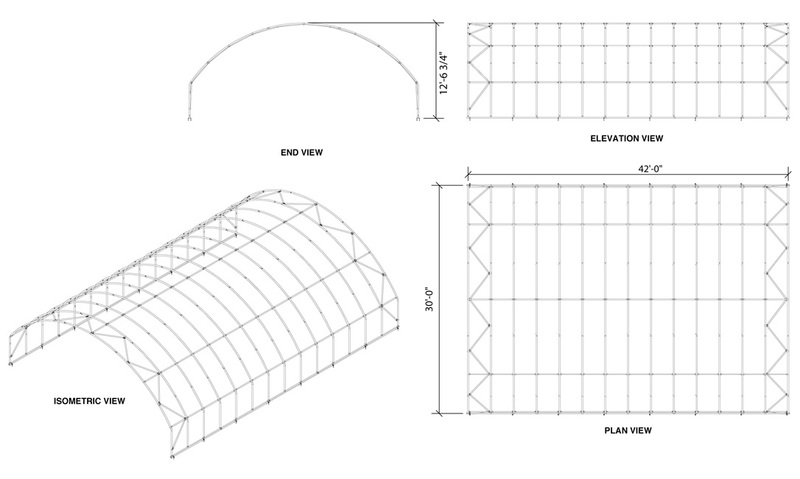 The new StorPro Tension Fabric Structure is the ideal solution for your hay and feed storage, sand and salt storage, tractors or construction equipment. 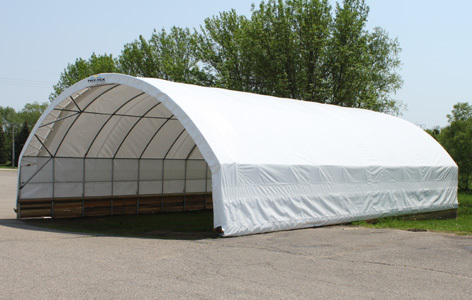 Tension fabric buildings are also ideal as livestock structures or for inventory warehousing. 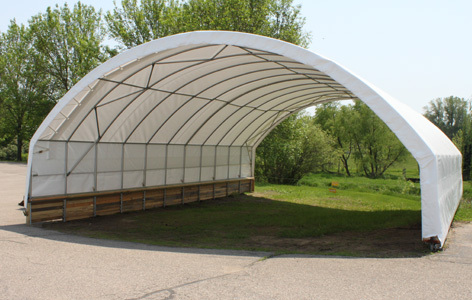 Unlike steel covered structures, tension fabric buildings provide ample daytime light and resist corrosion. Wide open spans give you maximum square foot for storage without center supports getting in the way. And the best part? StorPro features quicker installation than steel structures and the ability to relocate it when necessary! It can also be installed at ground level. End wall and door options now available! Foundation and end wall materials not included. The StorPro structure uses galvanized steel tube to protect from rust and corrosion. Our 12oz polyethylene fabric covers are lightweight but remarkably strong for protecting the structure from the elements. Wide open spans give you maximum square foot for storage without center supports getting in the way. 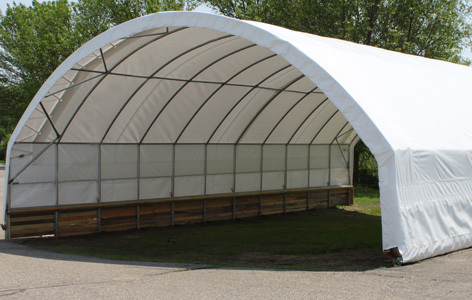 Straight sidewalls give you more usable space than conventional arch structures. Our StorPro's fabric covers significantly reduce the need for artificial lighting, helping lower your energy consumption. Also with abundant daytime lighting, the interior of a StorPro structure is the perfect environment to store your products, vehicles and equipment. 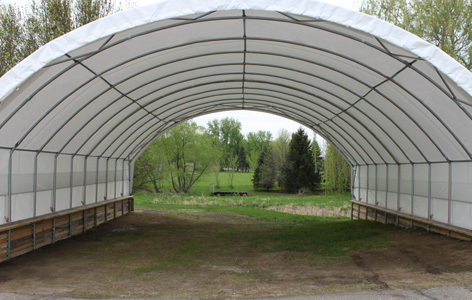 StorPro structures have a quick installation – fabric structures go up in less time than traditional wood or steel structures. They also have the ability to be relocated, if necessary, and require very little maintenance. This end frame option allows additional protection from the elements versus an open ended structure and still allows room to move your equipment, hay, or other items in and out easily. 2" x 3" 14 ga. galvanized tube steel and 12 oz. polyethylene fabric cover. The "garage-style" overhead door end option allows protection and a latch that accepts a lock. White, non-insulated steel door with rope hoist. This end option includes two sliding track doors with 2" x 2" galvanized tube steel door and 8mm clear polycarbonate. End frame is 2" x 3" 14 ga. galvanized tube steel and 12 oz. polyethylene fabric cover. The manual roll-up door on this end package makes it the most economical of our door option. Galvanized 1.163" dia. steel roll up crank and white 12 oz door. polyethylene fabric. End frame is 2" x 3" 14 ga. galvanized tube steel and 12 oz. polyethylene fabric cover. This closed end frame option for the StorPro includes 2" x 3" 14 ga. galvanized tube steel, 12 oz. polyethylene fabric cover, and 4' x 4' galvanized steel and aluminum gravity closing louvers for additional ventilation.